I recently had a reader email this question. I sent a short answer, but thought this was deserving of a longer answer in the form of a blog post. Please read this article about why heat exchanger cracks do not allow carbon monoxide into the house. The author has been in the industry for years as a trainer for HVAC technicians. I personally think that the HVAC businesses have a great scam going by locking-out people’s furnaces without any measurable evidence that the CO levels are above normal. I think they use cracks to strong-arm sales so they can provide a replacement quote on the spot. I wish the attorney general of MN would not allow this kind of thing happen. After all isn’t this why we buy CO detectors? HVAC businesses are using cracked heat exchangers to scam people. HVAC businesses in Minnesota lock out furnaces when cracked heat exchangers are found. Carbon monoxide detectors will keep people safe from carbon monoxide. Cracked Heat Exchanger: Sales Scam? I checked out the COmyths web site. There’s a lot of good info on there, but some of it is misleading and there are a lot of straw man arguments made. For example, the headline at the beginning says “Myth #1 – A furnace with a cracked heat exchanger will definitely produce carbon monoxide and poses an immediate danger. (Wrong!)” . Yes, that’s an incorrect statement, but I’ve never actually heard anyone say that. That headline is easily made true by rewording the sentence just slightly: a cracked heat exchanger has the potential to increase carbon monoxide levels, and has the potential to pose a danger to the occupants. So what’s a cracked heat exchanger all about and what’s the big deal? I wrote a blog post many years ago discussing that topic, and the gist of my blog post was the same as what’s stated on the COmyths web site; a cracked heat exchanger probably isn’t as dangerous as many folks make it out to be, but the furnace (or heat exchanger) still needs replacement. Here’s the post: How Serious Is A Cracked Heat Exchanger? See? This isn’t a scam, even according to their web site. Do HVAC businesses lock out furnaces? Sometimes. If a company considers the heating equipment to present an imminent danger to the occupants, they might disable it, but this policy varies from company to company. If a heating company unscrupulously disabled a furnace in an attempt to strong-arm the sale of a new furnace, I would take serious issue with that. I don’t believe that happens though. At least I hope it doesn’t. When CenterPoint Energy identifies equipment as unsafe, they also red-tag the equipment. This means they affix a tag to the equipment saying it’s not safe to use. That’s about all. If someone turns the equipment back on, the gas police won’t come knocking at the door later that day. I blogged about this topic many years ago, and the information in that blog post is still accurate today, except the “red tags” that CenterPoint Energy uses are actually now white. They still call ’em red tags though. Click here for an example. Here’s that blog post: Red Tagged Furnaces: Is Legal Trouble Worse Than Death? Will carbon monoxide detectors keep you safe from carbon monoxide? But let’s back up a step. Are we talking about a carbon monoxide detector, or a carbon monoxide alarm? They’re not the same thing. UL listed carbon monoxide alarms will not alert you to low levels of carbon monoxide in your home because they’re designed not to. They’re life safety devices, designed to prevent people from dying from carbon monoxide poisoning. Carbon monoxide alarms are required by law within 10′ of each room lawfully used for sleeping purposes in Minnesota and throughout many parts of the country. Most homes that I inspect in Minnesota have at least one carbon monoxide alarm somewhere. These alarms are sold everywhere, and they’re fairly inexpensive. Click this link for more info about the rules for carbon monoxide alarms in Minnesota: Minnesota Requirements for Carbon Monoxide Alarms . For the record, CO alarms have a limited life; older Kidde CO alarms were good for seven years, but new ones are good for ten years. First Alert CO alarms are good for five years. If you don’t know the age of your CO alarm and it could be over five years old, replace it. 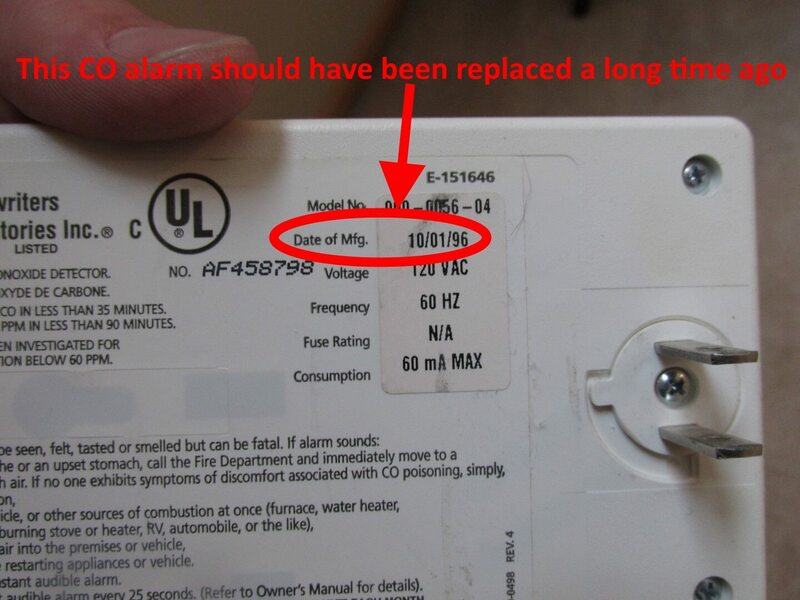 Most CO alarms have the date somewhere on the back; click here for an example. When installing a CO alarm, it’s a good idea to jot down the expiration date on the back of the unit. Carbon monoxide detectors, on the other hand, are far more expensive than carbon monoxide alarms, are not UL listed, and typically can’t be found in retail stores. They’re designed to detect the presence of low levels of carbon monoxide. In other words, a carbon monoxide detector will alert you to a carbon monoxide problem in the home far earlier than a carbon monoxide alarm would, but the vast majority of homes don’t have carbon monoxide detectors. For more information on the difference between carbon monoxide alarms and carbon monoxide detectors, check out my blog post on that topic: Low levels of carbon monoxide will not set off UL listed CO alarms. Again, carbon monoxide alarms are life safety devices. We buy carbon monoxide alarms to help make sure nobody dies in their sleep, but they are absolutely not a substitute for having safe equipment. Carbon monoxide alarms are the last line of defense. Relying on your carbon monoxide alarm to keep you safe and ignoring a potential safety hazard like a cracked heat exchanger is like ignoring electrical fire hazards in your home because you have smoke alarms. Smoke and carbon monoxide alarms are not there to keep you safe; they’re there to keep you alive. In other words, if you have a potential safety issue with your furnace that a professional heating contractor has identified, fix it. I’ve experienced the exact issue described by the email question. The furnace in the house I bought a few years ago was 20+ years old, so I signed up for an annual maintenance plan with a major local HVAC service company. At the first visit, the technician came to me before the job was even finished and warned me that the heat exchanger was cracked and that this posed a major risk for carbon monoxide poisoning, placing my family in risk of death, and that the furnace should be replaced. He even had pictures to show me the cracks. After listening to his concerns, my first question to him was “Have you tested for carbon monoxide leaks?” To which he shrugged and replied, “not yet.” He then finished the service, and lo and behold no actual CO leaks were found. Scam? That might be a strong word. But its probably fair to say that many HVAC companies use the fear of CO and cracked exchangers to pressure people into replacing their furnaces. Now, I knew my furnace was near the end of its life and would need to be replaced at some point in the near future. But I simply could not afford to do so yet. So instead, I spent about $150 on some high quality CO alarms AND detectors (the ones recommended on the carbonmonoxidemyths website, in fact) and placed them on all levels of the house and in all sleeping rooms. I slept easier, the old furnace chugged along for two more winters, and I was able to replace it this year when I had the financial means to do so. I still use the same HVAC company for annual maintenance, but went with someone else for the new install, partly because I did not appreciate the pressure sales tactics. Hi Spencer, thank you for sharing your story. Thanks for sharing this blog! As a relatively new homeowner of an older house, I’ve found it to be very educational and a valuable resource.